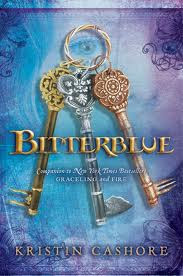 I've been waiting for Kristin Cashore's newest Graceling installment for quite some time. I love her writing style and the worlds and characters she creates. Everything/everyone is so full of life and fighting spirit in her stories. Bitterblue is a compelling read about a girl, and a kingdom, in recovery after a devastating tragedy (in the form of King Leck). Great attention to detail is paid to puzzles and ciphers and discovery, and the way Queen Bitterblue evolves as a capable human being is completely believable. That said, I'm having a hard time figuring out what the point of telling this story was in the first place. It's a very introspective story, more about self-discovery than anything truly relevant to the Graceling world. The bits about the seven kingdoms and discoveries seem almost casually thrown in. The love story between Saf and Bitterblue was a realistic exploration of first love, but in the end it bothered me, and I thought another potential spark (did I just imagine there could have been something between Bitterblue and Giddon? The setup was perfect!) was left unexplored and it was a dissappointment. Don't get me wrong - this book is really well written. The amount of research and time Cashore obviously threw into research and planning on the puzzles is admirable. And I like the characters. But, like I said before, I just don't really see what relevance this book has in the overall scheme of the Graceling world. The movement in the overall plot (about the Seven Kingdoms and Gracelings) could have been explored easily in a few pages in any book. This was a lovely tangent, Miss Cashore, but I really hope your next book gets back on track with the world nd storylines you so carefully crafted in Graceling and Fire. What a cool plot! I have to read it. Even though I enjoyed Bitterblue, I missed the action present in the other two books by Cashore. It seemed more professional.